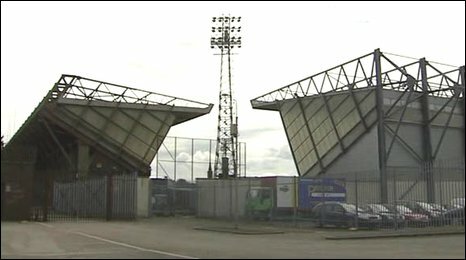 Proposals for the upgrade of Windsor Park football stadium have been revealed to the BBC. Linfield Football Club said a £20m boost from the public purse would lift capacity and address safety issues. The Stormont government has abandoned the Maze as a shared venue for soccer, rugby and GAA. Linfield claimed that their plan is "the most cost-effective way" for football to address the stadium issue. The draft discussion document obtained by the BBC, and dated June 2009, is with the Irish Football Association and the Department of Culture, Arts and Leisure. Since the Maze plan was shelved, government has asked the three sports for proposals on how facilities might be upgraded. The Linfield document advances two proposals. Option one is termed "an interim fix" at a cost of £3m. The club believe this would refurbish the north and south stands - the stadium's two major spectator areas - and construct some form of new east stand at the railway end of Windsor. Capacity would remain unchanged at 13,500. "We believe this sum is substantially lower than other consultants have outlined," the document states. Option two, described as the "long-term fix" would require funding of £20m and see capacity rise to 20,000 to include new south and east stands. As would likely be expected by government, Linfield indicate they would be prepared to renegotiate its current contract with the IFA for ground use, which has 80 years to run. A "new arrangement" would replace it. Linfield suggest a holding company is formed - Windsor Park Limited - complete with a stadium manager and a board including representatives of the IFA and the government body Sport NI. The club also floats the idea of working with rugby and while the document does not say it explicitly, the inference is Windsor could be used for major Ulster rugby fixtures. Linfield's ideas should be seen in the context of the bigger picture. The IFA, for example, might be equally happy using any new stadium in east Belfast and then there is what government considers value for money. But Linfield appear to have tailored a plan from tighter times. They said their Windsor plans are relatively inexpensive options - something also achievable without huge planning issues. A business consortium, Eastonville Traders Ltd, has also proposed building a new stadium for football and rugby in the Sydenham area of east Belfast. The arena would have a 20,000-capacity and would be built on a 90-acre site beside the Danny Blanchflower Stadium, but would not host GAA fixtures.